Julia: The first significant change in my life happened when I emigrated from Mainland China to the United States at nine years old. When I reached university age, my parents defied Asian stereotypes and supported me in studying the humanities rather than something related to engineering or accounting. I received a master’s degree in English literature from the University of Pennsylvania but afterwards realized that my true desire was to write, not simply analyze what others have written. That was how I jumped from the narrow field of academia to pursue a career that is even harder to survive by. Nowadays, I write stories that are important to me, and I hope that others will find something meaningful in them as well. To feed and clothe myself, I work as an English teacher at an elementary school in Seoul. Luckily, the sappy things they say about how rewarding teaching is happen to be true. I tend to use creative writing to escape from teaching, but just as often, the reverse happens, too. Erik: My name is Erik Thurman and I’m an English as a Foreign Language teacher at Aloysius Elementary School Orphanage in West Seoul, South Korea. I’m also a writer/artist of non-fictional comics and comics journalism. Originally I was born in Modesto, California back in the US, growing up in troubled neighborhoods and gang violence. Needless to say at the age of 18 I got out of there as quickly as I could by signing up to join the military. I spent the next couple of years traveling the country before settling down in the Bay Area and began to study illustration and animation in university. By the time I had finished my education, I had worked something like over 30 different jobs over the course of my lifetime. 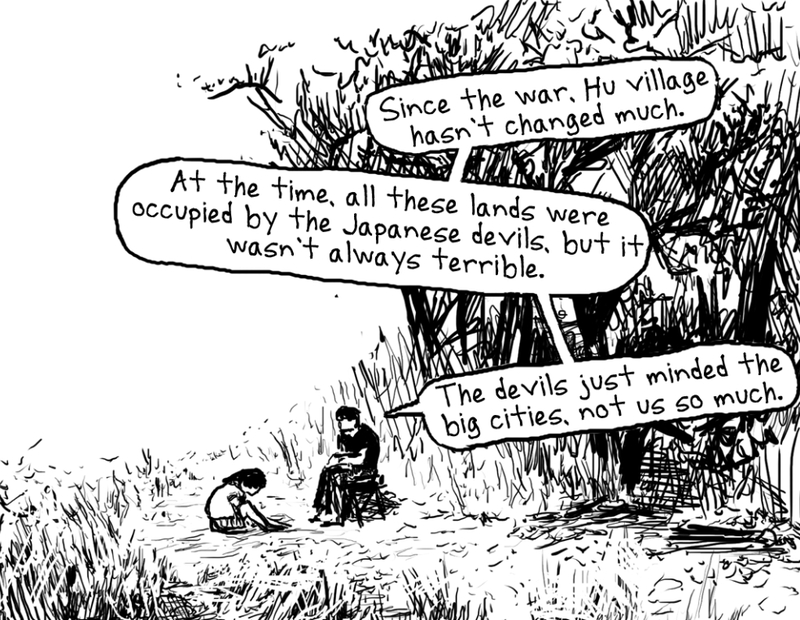 Now I travel around the world making comics about the lives of people in the countries I travel to and the things they find most important to them. Julia: A year and a half ago, I met my current boyfriend, Erik Thurman, fellow teacher/comic artist. Through our time together, I gleaned a little bit of knowledge about the comic-making process and the niche of non-fiction comics. Since then, I have been fully disabused of the notion that comics cannot possess the same literary and social value that prose and poetry can. “What Haunts Us” is my first attempt at writing for a comic, and I hope I will have more chances to collaborate with talented comic artists to tell stories that text alone cannot effectively communicate. Erik: After leaving the military, I wanted to pursue a field in which I could communicate a wide range of social issues that weren’t impeded by the barriers of language. Because of this I quickly found myself pursuing fine art and later on made the switch over to illustration. Illustration in particular interested me as a medium for expression because it is able to be reproduced to a wider audience at an affordable price, that and it can be accessible in more outlets. Unfortunately my professors didn’t see eye-to-eye with me in university as I was nudged towards the mainstream entertainment industry, an industry I feel overly promotes violence against women, disenfranchisement of minorities, and the glorification of war. So I packed my bags, bought a ticket overseas, and started writing and illustrating stories about my travels while using comics as my medium. Without giving too much away, tell us about your story “What Haunts Us” and how you approached it. Julia: “What Haunts Us” is part ghost story and part historical fiction set during the Second Sino-Japanese War. It was inspired by a story I heard about my great-uncle who died under mysterious circumstances around that time. I interviewed my mother and grandmother for more details on the story as well as on what life was like in 1930s China. I hope that the comic has successfully captured the essence of that place and time as well as timeless themes of family and loss that many could relate to. Erik: The comic originally came to be during a conversation that Julia and I had one evening about her family’s history. Even though I’ve never been to mainland China before, I have always been interested in the conflicts between Japan and its neighbors during that time period. My job for this comic was to handle all of the artwork and visual research based on the interviews that Julia conducted previously. We worked back and forth to make sure that the settings and characters were as accurate as possible, along with going back and trying to fill in any holes in the memories of Julia’s mother and grandmother. Julia: I am exploring the works of the latest Nobel literature laureate Mo Yan, starting with his novel Life and Death are Wearing Me Out, a magic realist take on the history of China from 1950s to more recent times. I also try to keep up with the blog of the famous racecar-driving writer Han Han, who offers trenchant, humorous views on society and media. Han Han’s novel Triple Door is available in English, for anyone who is interested. In addition, I am finally starting to check out Scott McCloud’s Understanding Comics. It’s a helpful read not just for comic artists but storytellers in general. Erik: Well right now I’m reading Killing Me Softly by Aloysius Schwartz; the author being the man who founded the orphanage I work at here in Seoul. His story details his last few years of his life and his battle with Amyotrophic Lateral Sclerosis, a disease that slowly inflicts paralysis throughout your body till your lungs stop breathing on their own. Besides that I’m also checking out “The New New Journalism” by Robert S. Boynton, a must read for anyone interested in seeing how different individuals are advancing the field of non-fiction and journalism. Lastly I’ve also been trying to keep up with the digital comics journalism publication “Symbolia,” which features excellent works from writers and artists around the world telling about true events. Julia: Erik Thurman and I met by chance on a bus almost two years ago. I had always been an introvert, but on that day, I overheard an interesting conversation between two strangers and was somehow possessed to jump in. Fate would have it that one of those people turned out to be my partner in more than one way. 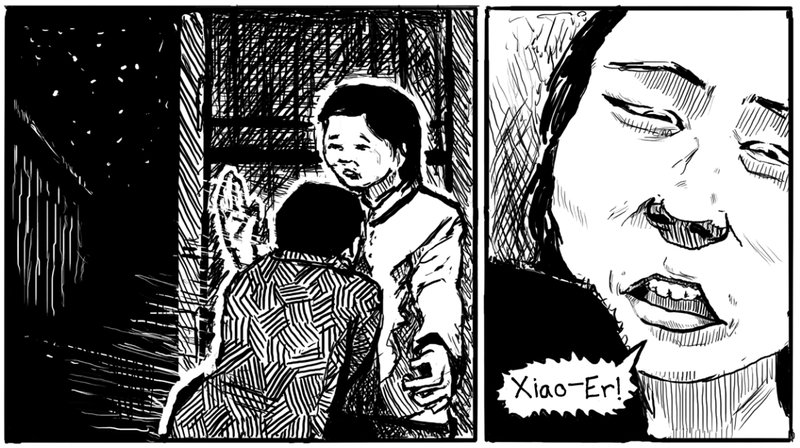 For “What Haunts Us,” I interviewed my mother (who is the little girl in the comic), translated the transcript from Chinese to English, and drafted the plot. Erik handled the much more time-consuming task of drawing it all. Collaborating creatively with a close friend or significant other presents with certain obstacles, but the benefits, in my opinion, are definitely greater. I was grateful to have the chance to work with someone whose style I am deeply familiar with and whom I trust (almost) completely. It has also been a good learning experience for me, as I tried to write a story that could translate well visually. Erik: Long story short, Julia and I met up on a bus heading coming back from a teacher’s training course in Seoul. She had just gotten off the plane traveling from Toronto and finishing up her Master’s at the University of Pennsylvania, while I had just spent the past couple of weeks backpacking and being homeless in Japan and South Korea. We got to talking, ended up having coffee that night, and the rest is history as one could say. Working with Julia was actually one of the first times I had ever worked with another writer for a comic, since I typically write my own works. So it was definitely interesting getting feedback on my work and trying to adapt the drawing to properly fit the type of style that the writing called for. She handled the interviews in Chinese while I did my best to translate it in pictures, which overall I felt succeeded pretty well. Julia: Currently I am working on a collection of short, coming-of-age stories centering on a little girl growing up in China during a period of relative calm right after decades of tumultuous changes that most adults could still vividly remember but don’t talk about. I hope these stories could be published individually first. In case anyone would like updates on that, or if they enjoy short ramblings about Asia, education, or women’s issues, please find me at http://cautionjulie.blogspot.kr. Erik: This summer is going to be a busy time for me as I’m also working with The Cartoon Picayune in order to publish a short comic about Seoul coffee shops. Expect that to debut at CAKE in Chicago in June. Also coming up next year I’ll be releasing the first of my three part graphic novel series “The American Immigrant,” a memoir/journalistic piece about my travels in the Philippines, South Korea, and tentatively Zambia while working as a teacher and trying to explain the unaffordability and inaccessibility of global public education. You can find updates at my website at www.erikthurmanblog.blogspot.com.